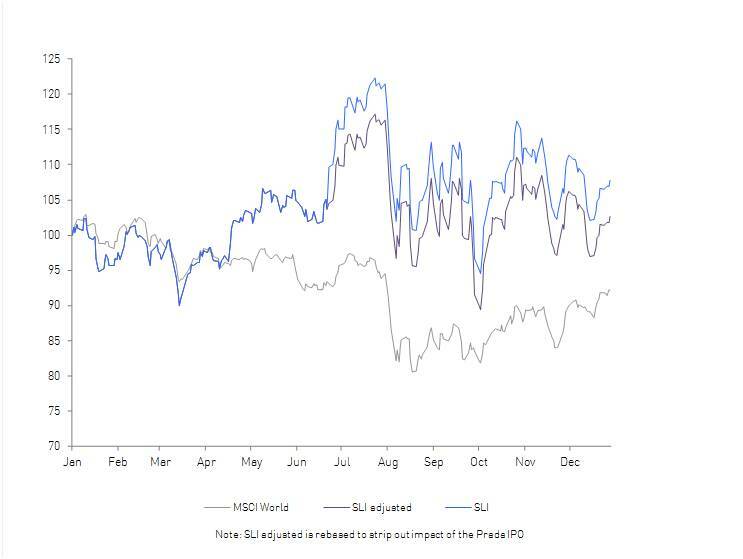 The Savigny Luxury Index (‘SLI’) outperformed the MSCI World Index (‘MSCI’) by 16 percentage points despite a string of severe beatings over the year. It gained close to 8% over the year, relative to a decline of almost 8% for the MSCI. Stripping out the effects of the Prada IPO in June, which mechanically boosted our index through the introduction of a large number of new shares, the SLI still ended the year up 3%. The past year has been a game of two halves for the SLI. The first half, with the exception of the Japan earthquake, was a period of relative stability and growth with our index significantly outperforming the overall market. In the second half however all hell broke loose in a period of uncertainty and strong volatility. 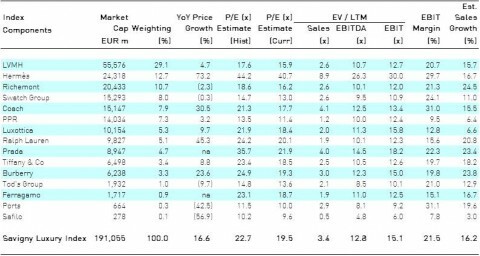 Driven down at first by profit-taking in January, the SLI evolved in line with the MSCI during the first quarter of 2011. The Japan earthquake in March pulled it down only momentarily before it overtook the global MSCI index mid–April, spurred on by reports of double digit sales growth across the sector. The SLI, perceived as a safe haven for investors amid the gloomy economic outlook, embarked on a steep ascent, gaining over 22% from the beginning of the year to its peak on the 25th of July (albeit including a 5-point Prada IPO effect). This compares to a decline of nearly 4% for the MSCI over the same period. 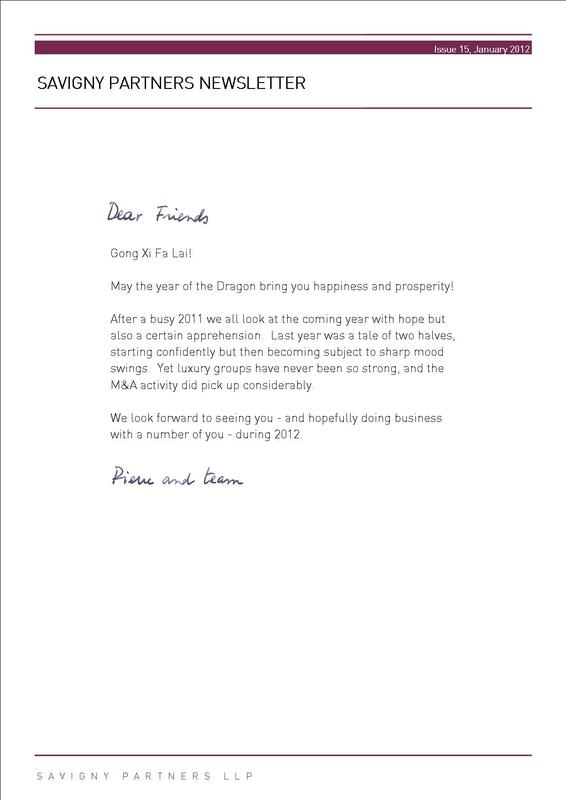 Successive serious concerns hit the equity markets during the second half of 2011. In August, markets fell sharply when the US lost its AAA credit rating and euro-zone debt issues started to materialise. In September, luxury stocks suffered a steep sell-off from hedge funds due to growing concerns over the Chinese economy slowing down. Global markets once again reacted to developments in the euro-zone debt crisis in September, November and again December, with Greece and then Italy taking centre stage. Despite a string of fairly sharp drops both the SLI and the MSCI managed to finish the end of the year more or less at the level where they stood at the beginning of June, down a few percentage points for the second half of the year. However the graph paints quite a different picture for the two indices, with much greater volatility for our SLI. For example, during the September sell-off, the SLI tumbled down by 12% over five days but then gained back 14% six days later, whereas the MSCI lost 3% and recovered 5%. The same pattern occurred again later. In November, our SLI was down 10% over eight days and then 7% in the next five days, compared to a same-period fall and recovery of 6% down and 6% up for the MSCI. In December, the SLI dropped by over 8% over a week and then up 5% the following week, whilst at the same time the MSCI fell 2% and climbed back 3%. 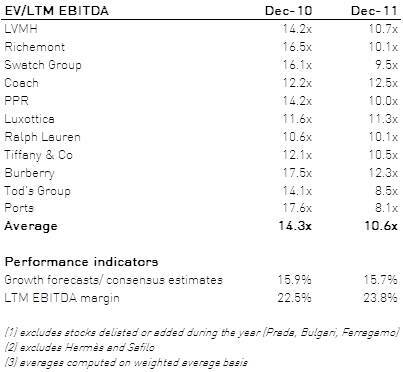 This took place whilst the luxury sector continued to produce both good news and M&A activity, running counter to the general doom and gloom prevalent in global markets: LVMH reporting nine-month Asian revenues up 27%; the USA luxury market coming back to life (Burberry’s first half US sales and Tiffany’s third quarter revenues up 25% and 17% respectively, record Thanksgiving weekend retail sales); Richemont announcing a 36% increase in sales for the first half of its fiscal year; Bulgari, Brioni, Moncler and Delvaux changing hands, amongst others. Overall, the luxury sector has proven resilient despite the difficult economic environment. The luxury groups have rarely been so profitable and well-managed, benefitting from worldwide platforms, efficient supply chains and global advertising campaigns. Analysts’ forecasts are bullish. Yet rarely have we felt so much uncertainty. Sector growth continues to be highly dependent on China, both on its domestic market and on Chinese buying abroad. Retailers are scared of taking up inventory across Western markets, where the sector as whole has an enormous accumulated investment in people, infrastructure, and stores. Other emerging markets (Brazil, some Southeast Asian countries and Russia) show enormous promise but don’t yet quite really add up to a significant share of the pie. The expected slowdown has not quite arrived yet, and nobody really knows how significant such a slowdown would be. Industry CEOs are keeping fingers crossed, and quietly playing with contingency plans and what-if scenarios they hope to never see. 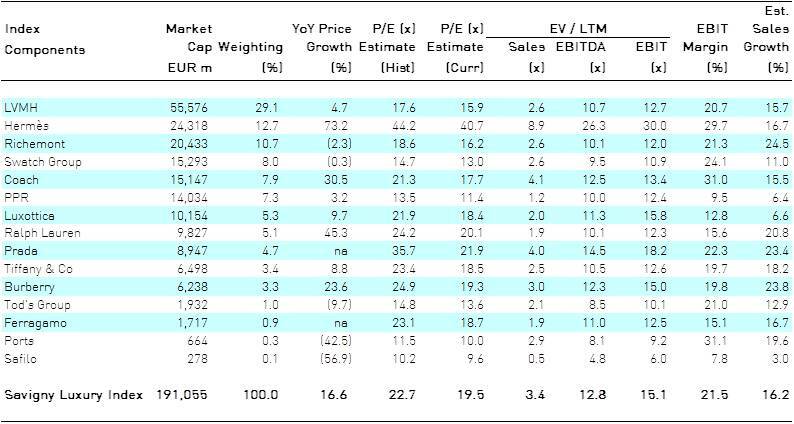 This is reflected in valuation multiples for the sector, which trade at a 25% discount compared to the end of the last year despite similar performance indicators (expected profitability and growth) as evidenced by the table overleaf.